Kitchen Design & Measuring Guides. Measure Your Kitchen. Since the early ’90s, our Carole team at at 215 Salem Street in Woburn has helped Boston-area homeowners with their new kitchens. 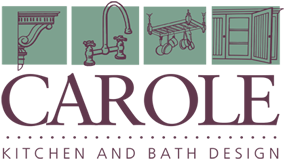 We specialize in crafting professional designs for people remodeling (or building new construction) and wanting NEW cabinetry and/or countertops. We guide you through product selection and storage solutions with customized layouts and products to suit your needs. If you are, in fact, seeking professional kitchen design and you’d like new kitchen cabinets or countertops, we can help! Over the decades—and literally thousands of kitchens—we have refined a process and established a fantastic showroom…to help you reach your individual project goals. Design Phase 1: Complimentary design consultation in our showroom. Photos of your current space, even if it will be changing. Clippings or photo links for styles/designs you like. We will review cabinetry options, finishes, storage, etc. and discuss your vision, time frame, and budget. After your first meeting, please allow about a week for us to work on your plans. Please do a QUICK MEASURE. 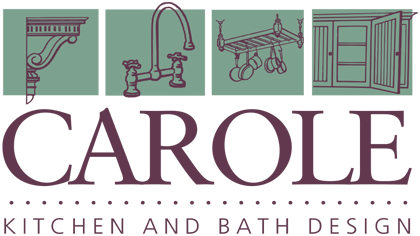 This gives your Carole designer enough basic data about your space to get started. Measure in INCHES each WALL (not cabinet), corner to corner. Note the width in INCHES of each appliance in current location. Note ceiling height (floor to ceiling) in INCHES. 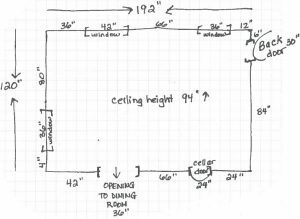 Measure doors and windows (outside casing to outside casing) in INCHES. You’ll see a preliminary 3D/computerized drawing of your new kitchen and get an estimate for cabinetry & countertop options. We provide these first two expert consultations and initial design preview at no cost to you. Why? We want to earn your confidence—in both our design expertise and the product selections offered. Your designer will ask you to sign a retainer agreement and pay a retainer fee. (100% of this retainer is used as a deposit toward your kitchen cabinetry purchase). This allows your designer to visit your home for an on-site measure and release hard copies of your personalized design plans to you/your installer. After the professional, in-home measure, your designer will finesse and complete your design, and he or she thoroughly reviews every aspect of your order. You’ll sign-off on your plans, purchase products, and we submit your order. You will receive a final copy of plans. We will call you when your products arrive in our warehouse to set up a delivery date.